Go slow and measure your fabric several times to make sure it is cut even for each side and edges. 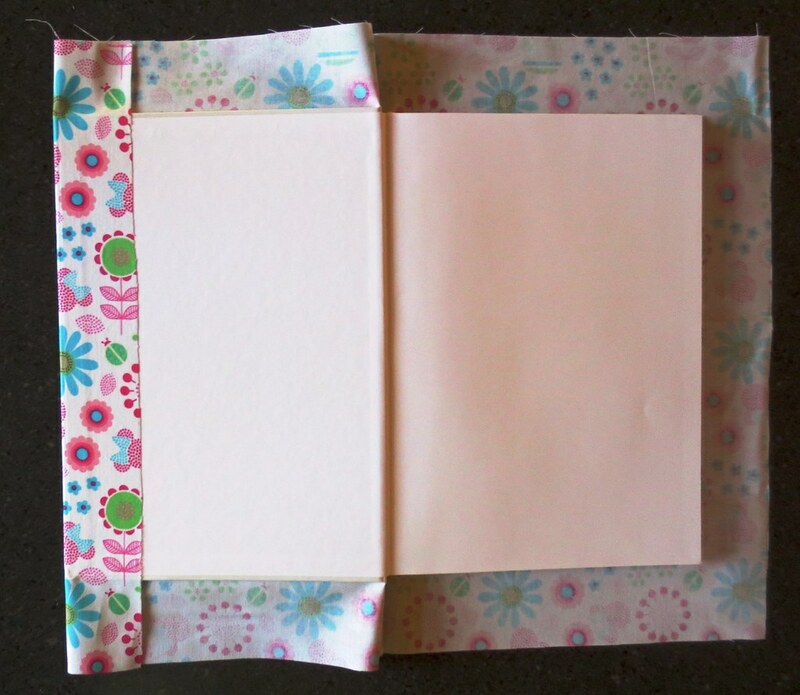 Fold fabric over and see how it lays before applying glue. Glue in sections and add extra glue to secure fabric edges once you have the fabric smooth and flat. Let glue set up before you start a new side. Remember slow is better so you don’t get your fabric wrinkled. 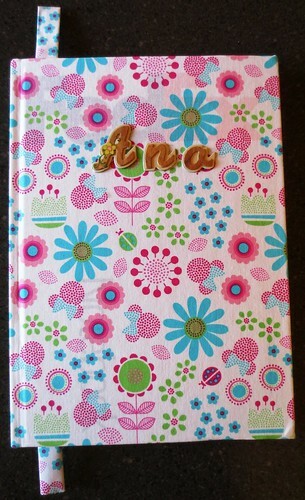 Put a heavy book on top after gluing so the fabric bonds nicely to the book. 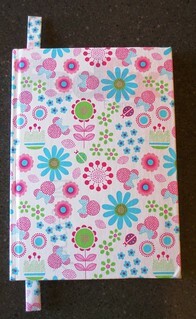 Cut the fabric at the top and bottom of the book spine so just a little piece is left to glue under at the spine edge. 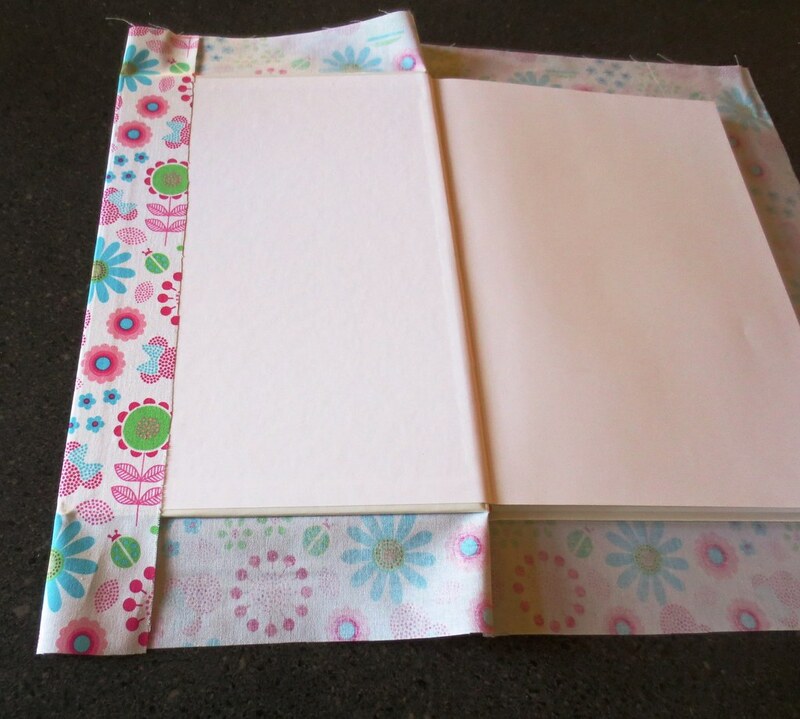 Here is the how-to with a picture tutorial showing the steps for making a cloth covered bookcover. 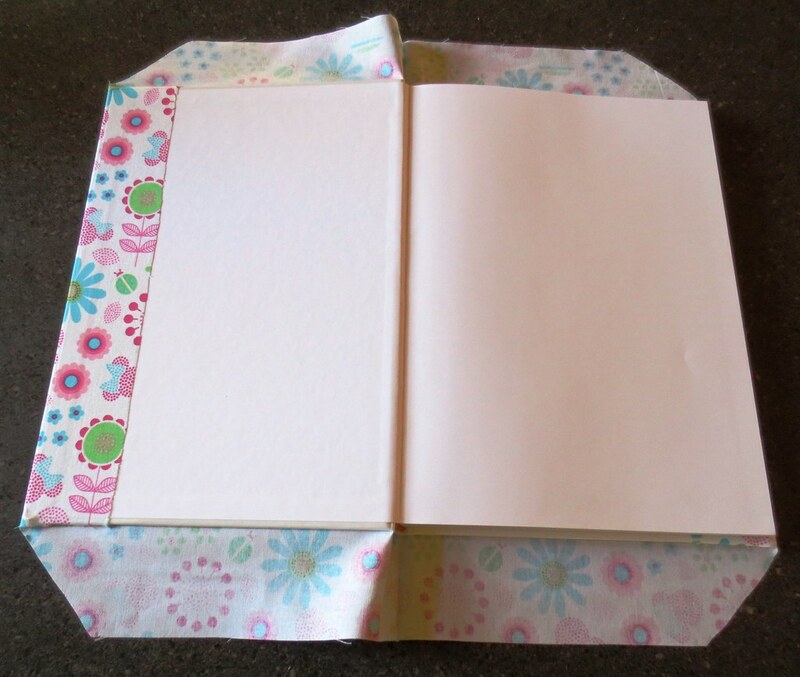 First I laid out the book on the fabric and cut a generous amount out to cover the book and edges. See photo below. 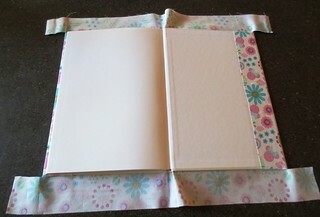 Next I trimmed and checked the layout of the fabric on the book. I allowed for a 2-1/2 inch overlap on the inside of the book. Next I folded over the front cover and again checked my edges to make sure everything was cut evenly. 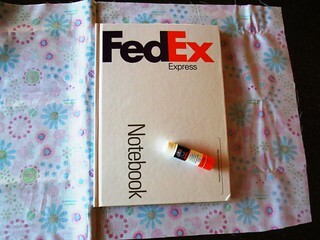 I used Elmer’s crafting glue to glue the fabric onto the front cover. 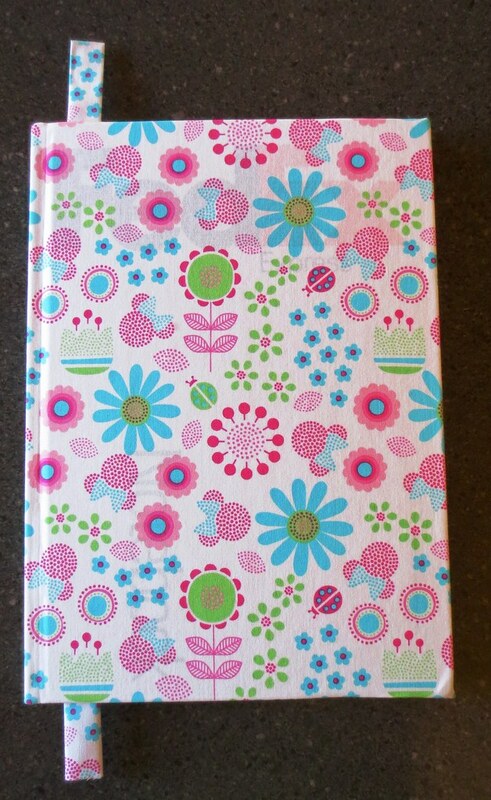 I smeared glue on the front cover and pressed down on the fabric as I smoothed it against the book’s front cover. Then I moved to the back cover and repeated the gluing for that side. I only glued the front and back covers. I did not do the sides yet. I then waited for the glue to set before continuing with the inside edges. 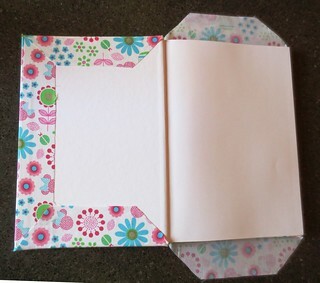 Cut over at the corners as shown in the photo so the corner fabric can be trimmed and folded over. I cut the edges at about 45 degrees to make an angled corner. 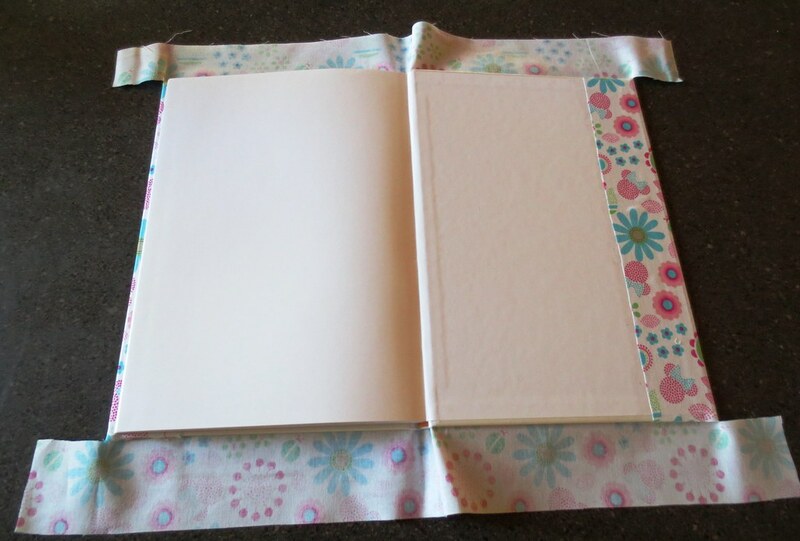 Apply glue to the book along the edging to match the fabric. 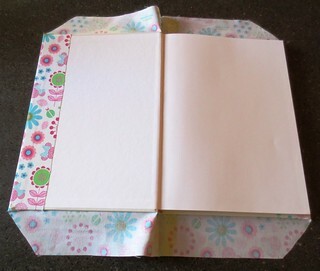 Fold the top and bottom fabric pieces inside as shown. Smooth out the edges and add glue from the stick to the fabric edges to secure. Once the glue is set on the front book cover, glue the back cover fabric in place by repeating the process. Here is the finished outside before I added the stick-on lettering. 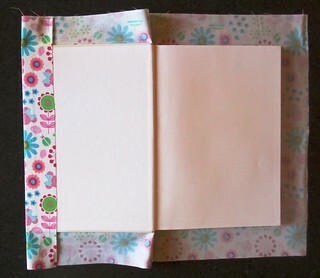 I also made a bookmark by cutting a long strip of fabric and folding the fabric over a few times to hide the raw edges. 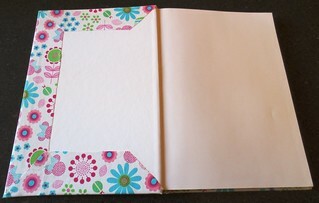 Then glue the edges of the fabric together for a quick no-sew bookmark.